Belgium won through on the tense and thrilling final afternoon of the Longines FEI Jumping Nations Cup™ Final 2018 at the Real Club de Polo in Barcelona (ESP) today. With all eight nations that qualified from Friday night’s first round starting again on a zero scoreline, and just one more round of jumping to decide the new champions, it was a roller-coaster ride over a big, challenging track set by Spanish course designer Santiago Varela. And, in the best sporting tradition, it was impossible to guess the outcome until the very end. Like so many of the other teams, the Belgians had mixed fortunes, Niels Bruynseels kicking off with a superb clear from Gancia de Muze but both Pieter Devos (Claire Z) and Jos Verlooy (Caracas) each leaving three fences on the floor. However last man in, Nicola Philippaerts, kept a cool head to bring H&M Harley v. Bisschop home with a foot-perfect run that would prove plenty good enough to clinch it. 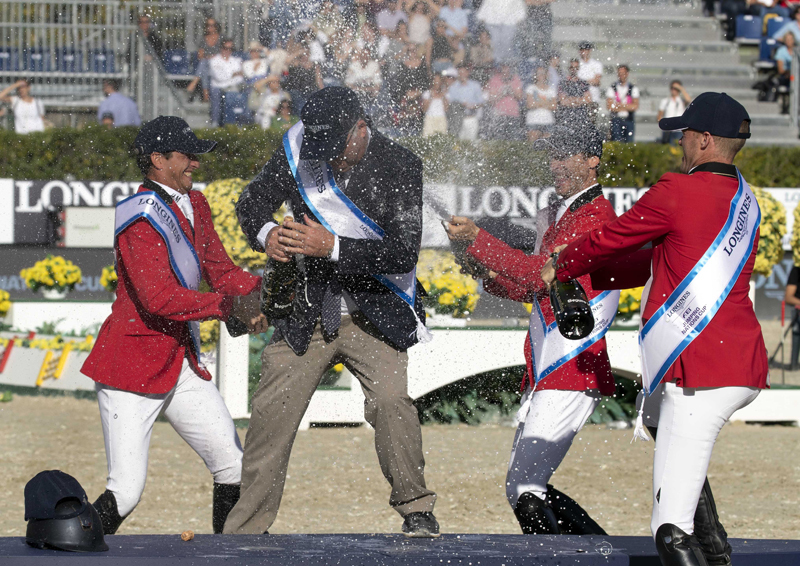 It seemed to have fallen into the lap of the Italians in the closing stages, as a clear from their anchor rider and last man into the ring, Lorenzo de Luca (Ensor de Litrange), would see them complete on eight faults to win it. But Varela’s extraordinary track was one that had to be ridden with absolute precision, and when, like so many before him, it unravelled for the Italian on the final line, his team completed on a total of 16. And because their combined times were slower than the French and Irish this dropped them into fourth place ahead of the Dutch when all four teams finished on a 16-fault tally. Sweden and Austria slotted into sixth and seventh places when both posting 20-fault finishing scores and Switzerland lined up eighth and last when putting 32 on the scoreboard. It’s no surprise that Varela has been selected as course designer for the Tokyo 2020 Olympic Games. Today’s track was a masterpiece that questioned control, balance, judgement and skill, every inch of the way. As Varela pointed out it wasn’t about the number of faults the riders collected. “A score of 8 or 12 didn’t mean they had a bad round, horses jumped unbelievably, but the course was difficult, tough and big….and everything was connected”, he explained. That was borne out by the number of riders who lost out over the last four fences where an oxer to a vertical could be tackled on a five long or six short strides, but where an error of judgement often led to mistakes at the penultimate double and final oxer. In the end the Belgians were the only side that managed to produce two clear rounds – “and two clear rounds today was a super result!” Varela said. Bruynseels was asked if he had a plan when setting off with Gancia de Muze to produce the first clear round of the competition. Bur apparently he doesn’t really “do” planning with his brilliant but quirky 12-year-old mare. Philippaerts said his team-mates told him “everything is still possible” when he was last to go. “I just tried to ride my own class and it worked out well – today it was me that could make the clear round that would make a difference, and another time it will be one of the others” he said. And he had even more reason to be pleased when sharing the €100,000 bonus for double-clear performances with team-mate Bruynseels, Sweden’s Peder Fredricson and Italy’s new star, Riccardo Pisani.